July 25, 2011 Angela G.
Seriously, ginger scallion sauce, just stop. You have definitively rocked my socks. And all to the point that I say bad words when I see you. You. are. greatness. When Escoffier sang the praises of his transcribed mother sauces, he missed the mark with you. If bechamel and hollandaise and and velouté rule the roost, you built the roost from ashes and sheer will. It’s no secret that I’ve always been enamored with ginger, but this sauce paints it in the finest of lights. Grated ginger and minced scallion are barely cooked in hot oil, taking away all of the bite from the aromatics and leaving behind a condiment that can make the most stubborn palate sing. This sauce is BFFs with poached chicken as the dynamic duo, “Ginger Scallion Chicken”. I don’t limit the stuff, though – string beans, skirt steak, steamed fish, my fingertips. I’ll attack this sauce with calculating ruthlessness. It’s mine, and I don’t want to share. Ok, I’ll share, but you bring the ginger and scallions next time. Everybody knows that I’m a fan of mushrooms. And yes, I just said that in my best Phaedra Parks voice. I’m amazed by folks who aren’t down with fungus, but that emotion is quickly replaced with, “If you’re not gonna eat those, I’ll take care of ’em for you.” In addition to the plebian (but ever so delicious) market staples of white buttons, portobellos and cremini mushrooms, I’m a huge fan of those mushrooms that are literally found off the beaten path. Maitakes, enoki and chanterelles are all beloved, and pricey morels are a necessary splurge during their short spring season. Even the funky ones that are more chewy than spongy, like the wood ear mushrooms or black trumpets. I particularly love the versatile ones that hold up to all sorts of cooking and cuisines, and oyster mushrooms are no exception. Royal oysters (sometimes called King Trumpets) are fabulous in that after a little cooking, they still retain all of their flavor and their texture. So much so that you can actually marinate them and grill them, treating trumpets like a protein rather than a vegetable. If you see these guys at the market sometime, give them a whirl – they’re a simple side and will sway even the most skeptical mushroom eater. Actually, sway or no, who cares. I want to eat these and not share with anyone. I’m not kidding. Mix balsamic vinegar, olive oil, salt, pepper and rosemary together in a small bowl. Pour over mushrooms and toss to mix. Marinate for 20 minutes. Heat a grill or a grill pan and oil lightly. Place mushrooms on the grill and cook for about 3 minutes on each side until the mushrooms are slightly browned. Serve. May 30, 2011 Angela G.
Summertime has always meant trips to the farmer’s market – from the dripingly ripe tomatoes to the sweetest ears of corn, I couldn’t help but swoon over access to ingredients as flavorful and delicious as these. Despite my dependence on the convenience of grocery stores, shopping at the market was a reminder of the fact that we can all make a commitment to using the freshest ingredients possible. Summertime meant easy access to the most incredible veggies, and took the focus off of planning before shopping. You could go with a blank slate and a lack of a menu, and just resign to be inspired by what was available. It was liberating, really. This salad is a winner for the spontaneous and the planners alike – during the summer, heirloom tomatoes are readily available and simply begging to be tucked into. Green beans are crisp and sweet and ready to snap the ends and crunch away. You can even access buttery heirloom potatoes for use in this salad that come in just about every shade. The entire salad is held together by a basil vinaigrette that manages to brighten and highlight all of the flavors of the veggies. It makes a gorgeous potluck and the perfect accompaniment to grilled meats, but it’s nourishing enough as a main course and absolutely vegan. Like I said before, the perfect summer celebration. Bring a large pot of water to a boil and salt heavily. Add the potatoes to the boiling water and cook until tender, about 10 minutes. Drain with a slotted spoon and cool with running water. While the water is still boiling, plunk in the haricot verts and blanch for 1 minute. Drain and cool with running water. Add chilled potatoes and green beans to a large bowl. Add the tomatoes to the bowl and set aside. In a food processor, add the garlic, basil, salt and pepper. Blitz to mince finely. Add the lemon and vinegar and blitz again. While the motor is running, stream in the olive oil. Turn off the food processor and pour dressing over the vegetables. Toss and chill for at least 15 minutes. Serve. May 9, 2011 Angela G.
I adore putting together a menu, but like a grocery shopper entering the store with a rumbling tummy, I find that I often set myself up for a challenge. Between my need to feed my guests with reckless abandon, to a love of a seemingly daunting menu, I face the issue of running out of steam. Couple that with my lack of prowess in the realm of desserts, I find that many of my menus end up being a bit front-loaded in terms of the serious cooking. Which is why, lovely readers, I am a sucker for a dessert that is simple to prepare, with a heavy dose of wow factor. January 2, 2011 Angela G.
The much-aligned cranberry gets a bad wrap – only typically broken out at the holidays in the form of a canned cylinder of fright, these tart lovelies are so much more. A long while back, my paternal grandmother decided to have a more cooperative Thanksgiving and assigned the kids recipes to bring. My sister and I were assigned a Cranberry Relish recipe that she had snipped from a magazine. The recipe itself seemed kind of wacky as we were making it, from the use of a whole orange (peel, pith and all) to the use of crystalized ginger, which we had never heard of at the time and had to look up (and this was well before “Google it” became a catch phrase). Turns out the spicy treats were considered candy in Australia and could be purchased with the other McCormick spices in the baking aisle. Who knew? Well, knowledge begets power and powerful that first batch of relish was in transforming our opinions of the lowly cranberry. Once an afterthought next to the turkey, potatoes, stuffing and green beans, this relish had star quality. 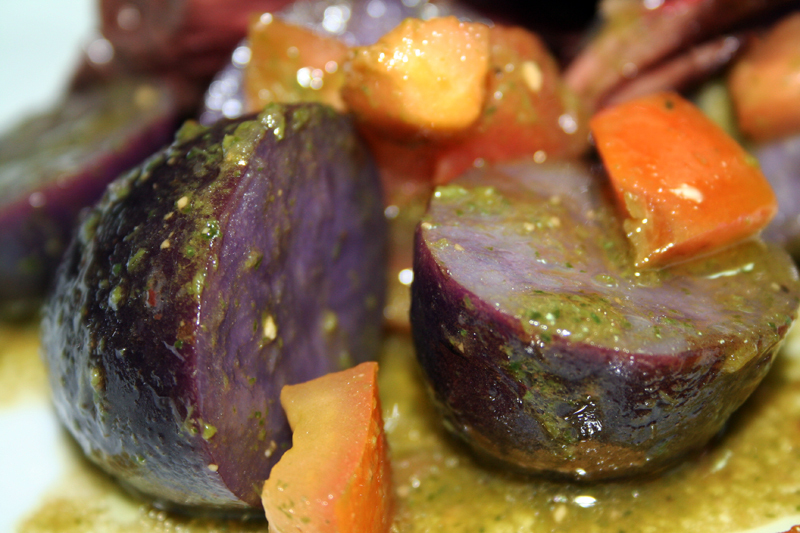 It’s ingenious in its ability to freshen up the heavy meal and enliven your palette. Best of all, it requires not a lick of cooking – just pulse everything in the food processor, pour out into a bowl and put it on the table. Done. For such freshness and flavor with absolutely no work, those cans of cranberry gelatin are looking mighty good for target practice right about now. Cut the orange in half and then into 1 inch pieces. 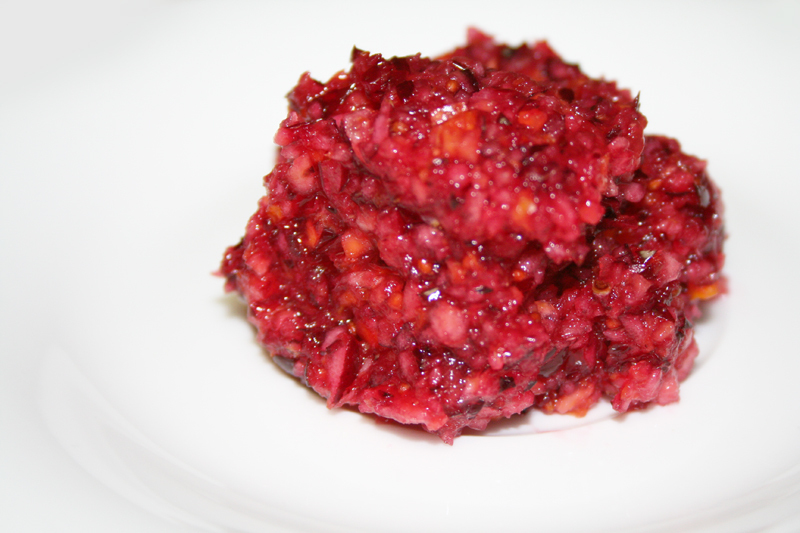 Add all ingredients to the food processor and pulse until it forms a chunky relish. Pour mixture into a bowl and let sit for at least 5 minutes to allow the flavors to blend. Store any leftovers in the fridge. In an almost atavistic longing for my childhood, you remind me of the Pickled Broccoli Stems that I could eat in heaps and heaps at the now closed Chinese restaurant, Hsiang Foong, or as we called it, “The Foong”. You were later replaced with El Pollo Rico, another love of mine, but I digress. PF Changs sells you for way too much money, but with a bit of change and a few minutes, I can make a far superior version of you in every way. You are so friggin’ easy to make. Make this as a side dish for a dumpling feast, or as an appetizer for your next FU to Chinese takeout, whereby you prepare a fresh meal without all the MSG, overcooked veggies, oversauced meat and stale fortune cookies (fortune and all). Your tummy will thank you. 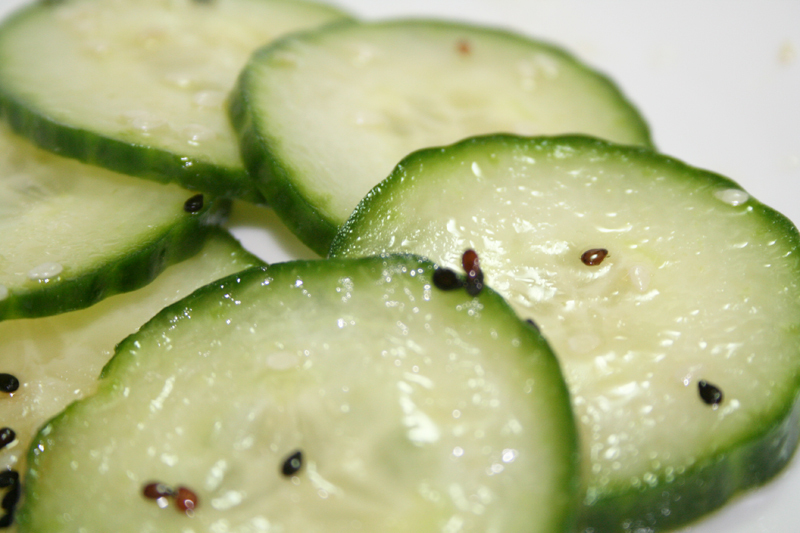 Slice your cucumber into thin, 1/4 in. rounds and place in a bowl. Add all other ingredients and stir gently. Let sit in the fridge for 15-20 minutes and then serve. The quest for the fall back side has one more contender in the running – this simple preparation of asparagus with a delicious italian condiment of the brightest flavor and texture is an absolute gem. Even better than how it tastes is the work involved, or should I say lack thereof. This is probably the simplest and most elegant side that you can put together, and should absolutely become a go-to recipe in your kitchen. Gremolata is a lovely mixture of finely chopped parley, garlic and lemon. It is most commonly used as a topping for osso buco (braised veal shanks) and other slow-cooked meat dishes that benefit from a lightening of flavor to round things out. The key to gremolata is prepping it as you need it and using the freshest ingredients. A simple toss with some asparagus and olive oil, this gremolata will bring the tender spears to a whole new level. Gremolata is absolutely versatile – if you’re not a fan of asparagus, try it atop simple roasted string beans or tomatoes. It also serves as a simple stir-in for minestrone and other savory soups. Be creative and definitely take advantage of the fact that gremolata will give your one-note dishes a huge kick in the pants. In a good way. 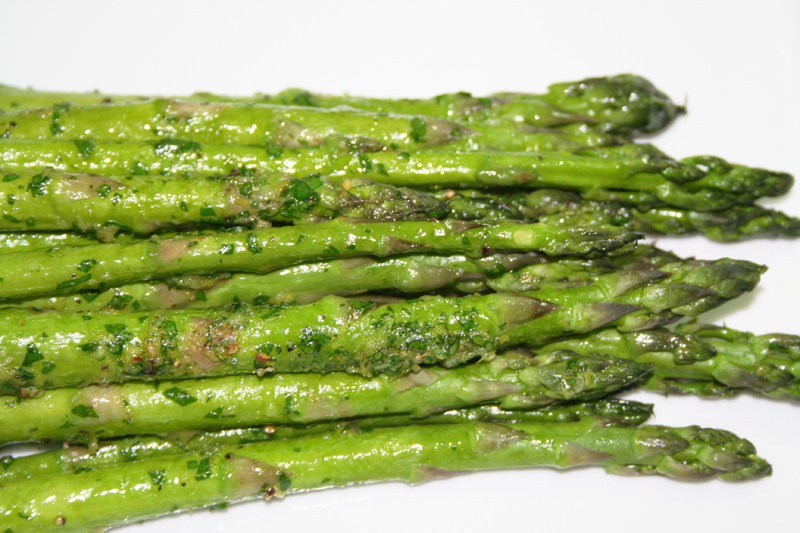 Place asparagus in a shallow pan and fill with water to barely cover asparagus. Heavily salt the water and bring water to a boil. When the water comes to a boil and the asparagus spears turn a bright green, remove them from the water and place them in a serving dish. In a small bowl, mix the parsley, lemon zest, pepper, a small pinch of kosher salt and olive oil. Pour over the hot asparagus spears and toss. Serve. June 10, 2010 Angela G.
Summer in NYC is marked by the presence of the hallowed italian ice trucks (or up in Spanish Harlem and the Bronx, the Coco Helado cart). Lemon, cherry, watermelon and the ever descriptive “rainbow” flavor are doled out into paper cups that are then eaten without a spoon – it’s a one-handed treat that is meant to be enjoyed on the run. The ices are a revelation, especially in the oppressively warm summer temps in the concrete jungle. How could you not be a fan?